President Bush’s Road Map to create a new Arab state between Jordan and Israel is in terminal tatters following the bloody events in Jerusalem on 2 July 2008 when an east Jerusalem Arab commandeered a bulldozer and went on a rampage through Jerusalem’s busy streets trying to kill as many people as he could before being killed himself. Another East Jerusalem Arab had previously murdered 8 Jewish religious seminary students on 5 March as they sat at their desks where tens of thousands of others had done so before them since its establishment in Jerusalem in 1924 under the British Mandate. The Arab response to President Bush’s Roadmap had embraced the uncompromising demand that millions of Arabs be allowed to emigrate to Israel - a position totally opposed by Israeli negotiators. That demand had been at the centre of Arab proposals to settle the Arab-Israel conflict since 1967 - long before the Roadmap finally saw the light of day in 2003. One may well ask then why the Roadmap negotiations have been allowed to run on since 2004 when this clear rejection of the Arab demand was in the public place. Surely no reasonable prospects of settling this intractable dispute could ever eventuate from the Roadmap negotiations unless this Arab demand was dropped. Yet despite this clearest signpost leading to a complete dead end in the negotiations, they continued on amid statements of ever growing optimism - fuelled perhaps even by desperation - that continued to be made in inverse proportion to what was being achieved in those negotiations. The Quartet - America, the United Nations, the European Union and Russia - refused to believe that their combined clout could ever hit a brick wall in bringing President Bush’s vision to reality and finality. They did not count on the continued Arab intransigence they were to encounter. All unequivocally supported the right of the Jewish people to a Jewish State. How could this support be possibly reconciled with supporting the demand that millions of Arabs be given the right to flood Israel and destroy its Jewish character? No doubt neither Jews nor Arabs wished to be seen as the ones to have ended the negotiations and have upset an American President who had intervened to try and settle a dispute that had escaped the best efforts of the League of Nations and the United Nations over the last 88 years. There were some - especially among the Israeli negotiators - who believed and hoped the Arab demand was a lot of hot air and that a combination of compensation and a limited entry of perhaps 100000 Arabs into Israel could satisfy this intransigent and entirely irrational Arab demand and bring about the longed for peace. 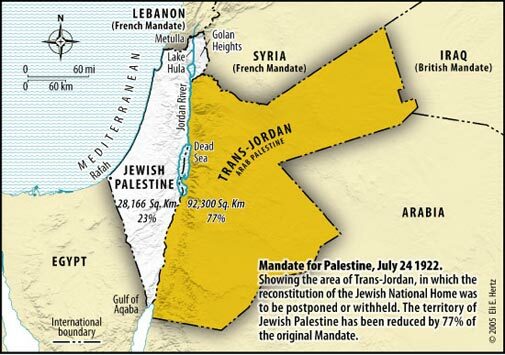 This proposal had been suggested in negotiations in 2000 but was categorically rejected by the Arabs. 1.4 million Arabs are presently Israeli citizens. 250000 Arabs reside in east Jerusalem and are the holders of Israeli blue Identification cards that allow them access throughout Jerusalem and the West Bank. Arabs make up 20% of Israel’s population. They have been long viewed with suspicion from time to time as a fifth column waiting to spread havoc when ordered to do so. Whilst their loyalty to their country is frequently called into question they have been able to achieve a standard of living and lifestyle that is the envy of those who live in the Arab States that surround Israel. A recent poll conducted by the Harvard University’s Kennedy School of Government showed that 77% of Israeli Arabs would rather live in Israel than in any other country in the world. Another poll conducted with 668 adult Israeli Jews for the Knesset Channel shortly after the seminary massacre in March showed that 29% wanted all Israeli Arabs relocated out of Israel into any new Arab state created between Israel and Jordan, 19% said relocation should only apply to settlements in close proximity to any new state, whilst 28% restricted relocation to those whose disloyalty to Israel could be proved. 24% were against any relocation taking place. Any lingering hopes that any sizable number of Arabs would ever be permitted to legally emigrate to Israel has ended with the last two traumatic events in Jerusalem. No doubt there will be circumstances where some limited emigration is permitted but it will be strictly applied and strenuously enforced. Israel obviously has enormous problems in trying to prevent terrorist attacks on its citizens by its own Arab population, to appropriately respond to them and is grappling with what it can do to end them. Any political party in this current climate of suspicion and fear espousing the lawful entry of more Arabs into Israel would be decimated at the polls. Israel’s political parties will unite in resisting the Arab demand and with it kiss goodbye to the Roadmap as the route to achieving peace between Jews and Arabs. Jerusalem on 2 July 2008 was judgement day for President Bush’s Roadmap - but not in the Christian understanding of the dead being restored to life. Rather the exact opposite happened - the Roadmap was buried that day by the Arabs in the graveyard of lost opportunities ending any hopes of President Bush’s vision ever achieving peace between Jews and Arabs in Jerusalem - the city of peace.